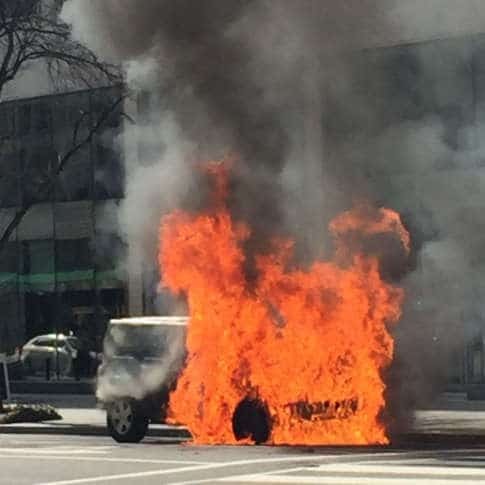 A Jeep caught fire and became engulfed in flames in downtown D.C. on Tuesday afternoon. WASHINGTON — A Jeep caught fire and became engulfed in flames in downtown D.C. on Tuesday afternoon. Photos and a video shared with WTOP show a Jeep covered in flames and thick smoke near the corner of 18th and M Streets in Northwest D.C.
D.C. Fire and EMS told WTOP that crews were called to the scene about 12:30 p.m. No one was injured in the blaze. There was considerable damage to the vehicle. WTOP’s Carlos Prieto contributed to this report.